Markets at 12:14 am on 21-11-2011. New Delhi: Shares fell 1.4% on Monday on broad selling by investors worried about a depreciating rupee, slowing growth and a sluggish policy environment, with a shaky global economic backdrop also dragging. Shares in Bharti dropped as much as 3.4% in early trade after the federal police searched its office along with that of Vodafone’s Indian unit over the weekend, seeking details on spectrum allocation by the government to operators between 2001 and 2002. 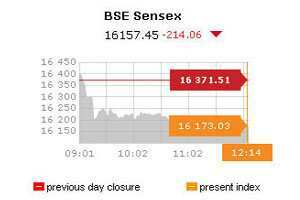 At noon, the main 30-share BSE index was trading 1.35% lower at 16,149.38 points, with 24 of its components in the red. The benchmark, which is down more than a fifth this year, is among the world’s worst performing stock index. Foreign portfolio investors have bought equities worth $571 million so far this year, sharply lower than $29 billion they invested in 2010. “A weak rupee is fuelling fears of a large-scale withdrawal from the (equity) market," said Deven Choksey, managing director at brokerage K.R. Choksey. Markets at 12:25 am on 21-11-2011. “A weak rupee means we will continue to import inflation. This is impacting corporate earnings and weighing on overall sentiment," said D.D. Sharma, senior vice-president at brokerage Anand Rathi. A near double-digit inflation has forced India’s central bank to raise interest rates 13 times since March 2010, slowing down Asia’s third-largest economy. Top lender State Bank of India, HDFC Bank and ICICI Bank were down about 1.8% each. India’s software exporters, which derive majority of their revenues from overseas, were down 1.15%, on concerns that a lingering euro zone concerns could curtail revenue. “A weak currency wouldn’t help IT exporters beyond a point as they hedge their position," said Ambareesh Baliga, chief operating officer at brokerage Way2Wealth Securities . Top software services firm TCS fell 1.87%, while smaller rival Infosys was down 0.78%. Sluggishness in pushing domestic policy reforms have also hit investor sentiment. Indian parliament will convene for its winter session on Tuesday with a long list of pending policy decisions, but analysts do not expect too many policy initiatives. The 50-share NSE index was down 1.36% at 4,838.90 points. In the broader market, there were two losers for every gainer, on a volume of 164 million shares. The MSCI’s measure of Asian markets other than Japan was down 1.67%, while Japan’s Nikkei was down 0.32%. • Oil marketing companies Indian Oil Corp, Hindustan Petroleum Corp, and Bharat Petroleum Corp were down more than 2% on concerns a weakening rupee would increase their cost of crude import. • Kingfisher Airlines rose as much as 7.9% on a newspaper report citing an official familiar with the development that the government had asked state-run Life Insurance Corp to buy stake in the debt-hobbled airline.